Is Net Promoter Score the Holy Grail? Second in a three part series of observations from the annual Forrester Finance Forum, How to Deliver Great Customer Experiences, held in New York June 23rd and 24th. Go here to read part one. Bill Doyle, Vice President and Principal Analyst at Forrester, was very clear and consistent in his refrain about creating great customer experiences, “Easy to say, hard to do.” This simple phrase is at once a mantra and a warning. In financial services mahogany suites around the world the following response to creating great customer experiences can frequently be heard, “We already do that.” This is where the warning makes its entrance. Unless your firm has a customer experience executive that is fully engaged and integrated across the firm and understands that customer experience is everyone’s job, then you probably have a ways to go. Ask those quick responders how they know. What are their metrics? Do they have them for each channel? Do they have them when customers are using multiple channels for the same transaction? Are the channels weighted? What is the weighting? Do they understand which channels are used by which customer segments? Ask them to show you their benchmarks. Are the benchmarks moving in lock-step with business results? And my personal favorite, where’s the customer experience roadmap that shows customer value, channel usage, level of interactivity, all correlated to likelihood to recommend? One of the biggest challenges is getting people to understand and share a common vocabulary about customer experience. The next is to recognize it when they see it. Obstacles to delivering great experiences are not new. These are massive problems that cannot be easily solved. 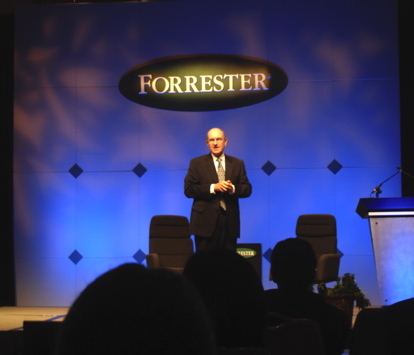 Forrester poured the forum foundation by demonstrating that a great customer experience does indeed drive positive business results. Fred Reichheld, founder of Bain & Company and author of The Loyalty Effect and Loyalty Rules spoke about his groundbreaking Net Promoter Score framework, in a talk entitled Winning the Loyalty of Financial Services Consumers. 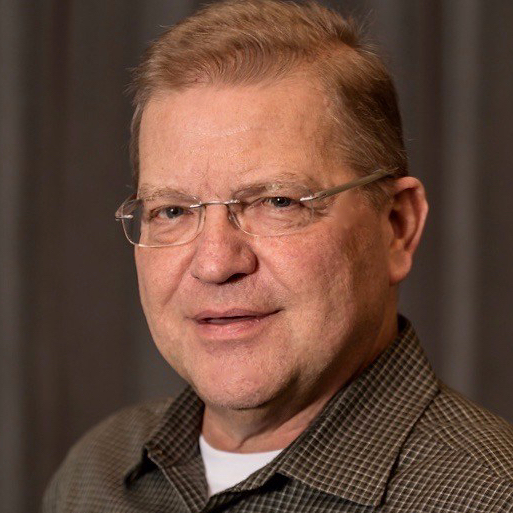 For 30 years, Mr. Reichheld has studied customer loyalty and has arrived at a simple, highly supported hypothesis that loyalty transforms economics. He has a loyalty chain slide to help companies understand the components of loyalty. 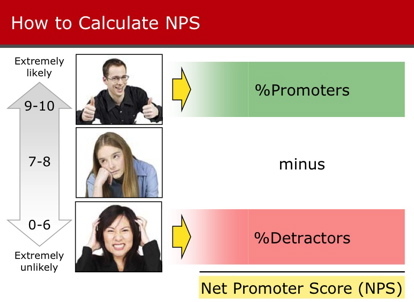 The Net Promoter Score (NPS) measures customer satisfaction. They are questions asked via phone or online after an engagement with the company. Customers that turn in scores 9-10 are bucketed as promoters. Scores 7-8 are categorized as passives. Detractors weighed in between 0 and 6. Throw out the number of passives, subtract your detractors from your promoters and you’ve got your NPS. Mr. Reichheld was informative, engaging and humorous. He told a personal experience he had with a rental car company. On a recent trip he returned the car 45 minutes late. The check-in attendant regrettably informed him that he would have to add half of a daily rate to the bill. Then there was the gasoline fee at three times retail price (that’s something like $12 per gallon). Mr. Reichheld protested, but to no avail. The attendant responded that he should have purchased the protection plan. “Protection plan,” said Fred. “Is this a rental car business or organized crime?” The attendant had the nerve to ask for a top 2 box satisfaction score. We’ve all been there. 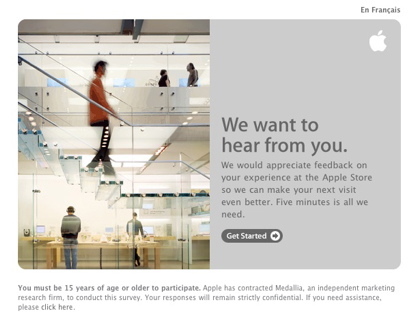 Apple was referenced as a regular user of NPS. 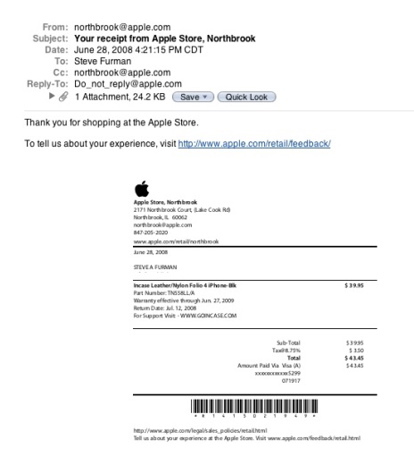 I made a purchase at my local Apple store yesterday. They hate cash registers and so my purchase was done in the middle of the store by a clerk tapping on a wireless device. My receipt was emailed to me. Here’s the email that has a link to the online satisfaction survey (also a great way to collect email addresses). Here’s the entry page to the survey web site. When a 10 comes in the employee of the Apple store is celebrated. When a detractor score comes in the store manager makes an outbound call to find out why. I was a promoter in this instance, but made a very detailed suggestion about store layout. In my opinion, the side shelving units are too close to the walls and there is not enough room to inspect the products and have someone walk behind you. The current floor plan hides a significant amount of SKUs. I provided them a detailed description of how they should reconfigure the layout into a series of V shapes. It would be visually more interesting and direct customers to walk in an interlacing fashion through the store. They could also improve their signage. I know I’m a pain, but I spent 9 years as the general manager of a retail bookstore chain. Retail is customer experience design. Forrester analysts are sharp, and always make it look easy. Maybe too easy. But inside corporate America it needs nurturing and a fact-based approach. Of course getting NPS deployed needs support from the very top; everything does. Just prior to Fred, Walt Bettinger II, President and COO of Charles Schwab & Co. presented. He employed NPS and made some tough decisions to try and get their business back on track. Walt was pitch perfect in his delivery and obviously was the guy Schwab needed to pull this off. It seems to have worked, but they were in crisis. What if your business is not in crisis? What if you hear everyone around you say, “We already deliver a great customer experience?” It’s much tougher. Forrester should tackle that topic next. In closing remarks, Fred offered some thoughts on how to get champions for adoption. NPS is still somewhat soft, but is gaining traction. Lots of case studies and blog entries can be found at netpromoter.com. It is more psychological and sociological in nature, but these are converging with business facts thanks to the rise of social media. You can’t improve your entire book of business with NPS. Look at profitability (vertical) and NPS (horizontal) together. Like everything, prioritize what you work on. B2B firms have adopted NPS at a faster rate than B2C. It requires a rethinking of the entire channel relationship with your customers. My take is that Fred’s really on to something. After all here’s a brilliant man who has put 30 years of his life into one thing. Improving customer experience requires more than one strategy, and this one appears to be close to the tipping point. 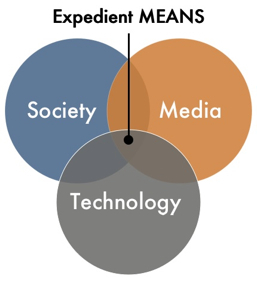 The meteoric growth of the online social community just might push it over. P.S. 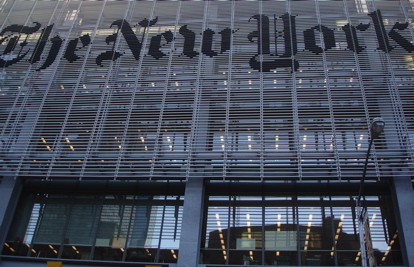 The photo of the New York Times building (first photo above) was taken from a taxi. I immediately had a spontaneous urge to scale the building. Fortunately my agency partners were with me and kept me in the cab. Thanks Heather and Frank. Thanks Steve, yet another great coverage post. I’m reading Fred Reichheld’s book to learn more about the value of NPS. Hopefully a Bot Free Zone. People only.